The very fact that agricultural machinery uses tremendous power to do work makes its operation a potential hazard for both the operator and bystanders. Even though manufacturers try to ensure that their machinery is as safe as possible, the nature of some work creates inherent hazards which cannot be removed. Most accidents with agricultural machinery can be attributed to human error. In many cases the operator either forgot something, took a shortcut or a risk, ignored a warning, wasn't paying close attention or failed to follow safety rules. Accidents with farm machinery can be crippling or even fatal. It is important to recognize and be alert to possible hazards and to take precautions to avoid injury. There are many different kinds of agricultural machinery - mowers, tractors, shredders, harvesters, grinders, blowers, augers, balers, etc. - but they all have similar characteristics and similar hazards. You can be cut, crushed, pulled in or struck by an object thrown by these machines. They can have cutting edges, gears, chains, revolving shafts, rotating blades, levers and similar hazards. You can also be injured if you fall while working on or near any of these machines. Some machine parts cannot be completely shielded in order to do their job. For instance, a cutting blade cannot be totally enclosed, or it could not cut. Operators remove guards for maintenance and often they don't get replaced. This creates a potentially dangerous situation. Most agricultural machines have similar or common components to do their work. A basic understanding of these and the hazards which they pose will heighten your safety awareness and prevent injury. Shear points are created when the edges of two objects are moved closely enough together to cut a soft material, as in the case of a pair of shears or an auger. Cutting points are created when a single object moves forcefully or rapidly enough to cut, as in the case of a sickle blade. Both shear and cutting points are created on machinery designed to cut, as in harvesters, and on those that are not designed to cut, as in an auger. They are hazards because of their cutting force, and because they often move so rapidly that they may not be visible. It can be easy to forget that they are operating. Because some cutting and shearing points cannot be guarded, it is important to be aware of the hazard and to be especially alert when they are operating. It is also important to warn others and to look out for their safety, because of the danger of thrown objects while using cutting-type equipment. Pinch points are formed when two rotating objects move together and at least one of them moves in a circle. For example, the point at which a belt runs onto a pulley is a pinch point. 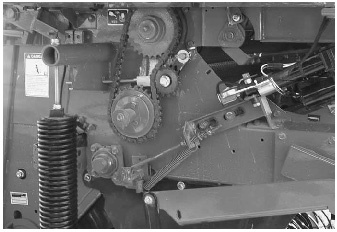 Belt drives, chain drives and gear drives are other sources of pinch points in power transmission devices. 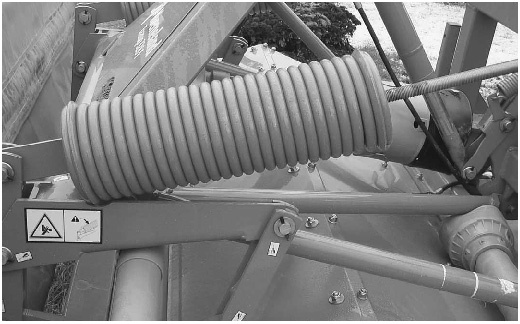 Feed rolls, gathering chains and similar equipment to draw crops into the machine also create pinch points. Fingers, hands and feet can be caught directly in pinch points, or they may be drawn into the pinch points by loose clothing that becomes entangled. Contact may be made by just brushing against unshielded parts or by falling against them. You can become entangled in pinch points if you take chances and reach over or work near rotating parts. Machines move too fast to get out of a pinch point once you become caught in it. To avoid injury from pinch points, be aware of the areas where pinch points occur and avoid them. Wear clothing that fits well and is not loose or floppy. Never reach over or work near rotating parts. Turn off machinery to work on it. Always replace shields if you must remove them for maintenance. Rotating shafts are the most common source of wrap point accidents, although any exposed machine part that rotates can be a wrap point. A cuff, sleeve, pant leg or just a thread can catch on a rotating part and result in serious injury. Entanglement with a wrap point can pull you into the machine, or clothing may become so tightly wrapped that you are crushed or suffocated. In other cases, you could be thrown off balance and fall into other machine parts. Even a perfectly round shaft can be a hazard if there is enough pressure to hold clothing against the shaft. Shafts that are not round increase the hazard significantly. Clothing is more likely to catch if there is a little mud or dried manure, or a nick on the shaft. Ends of shafts which protrude beyond bearings are also dangerous. Universal joints, keys and fastening devices can also snag clothing. Check all equipment for potential wrap points, and shield those that can be shielded. Place warnings on those that cannot be covered, or paint them a bright color, perhaps with wide stripes. Be aware of wrap points and be alert to their danger. Crush points are created when two objects move toward each other or one object moves toward a stationary one. For example, hitching tractors to implements may create a potential crush point. Failure to block up equipment safely can result in a fatal crushing injury. A jack may slip, a hose or overhead support may break, or the equipment may roll. Be sure to take extra precautions when working with machinery that is raised for any reason. Crushing injuries most commonly occur to fingers that are crushed at the hitching point. Wait until the tractor has stopped before stepping into the hitching position. If possible arrange the hitch point so that the tractor can be backed into position without anyone between. Always know what the other person is doing. The head or chest of an operator may be crushed between the equipment and a low beam or other part of a building. Usually, these accidents occur when operating the machine in reverse Tree limbs are also potential hazards when working with tractors and other machinery. To prevent being crushed or pinned, first, recognize the potentially dangerous situations, then, avoid them whenever possible. Block all machinery securely if you must work under it. If an implement can roll freely, block its wheels so it cannot roll. Many machine parts continue to spin after the power is shut off. Examples of this are cutter heads of forage harvesters, hammer mills of feed grinders, rotary mower blades, fans, flywheels, etc. Never touch these parts until they have stopped moving completely. This may take as long as several minutes. Springs are commonly used to help lift equipment, such as shock absorbers, and to keep belts tight and may harbour potentially dangerous stored energy. Springs under compression will expand with great force when released, and springs that are stretched will contract rapidly when released. Know what direction a spring will move and how it might affect other machine parts when released, and stay out of its path. Hydraulic systems store considerable energy. They lift implements, such as plows, change the position of implement components, such as a combine header or bulldozer blade, operate hydraulic motors and assist in steering and braking. Careless servicing, adjustment or replacement of parts can result in serious injury. High-pressure blasts of hydraulic oil can injure eyes or other body parts by burning or penetrating the tissue due to the liquid being hot. Leaks are a serious hazard. Never inspect hydraulic hoses with your hands because a fine jet of hydraulic fluid can pierce the skin. Jet streams from even pinhole leaks can penetrate flesh. Get medical attention quickly, or you could lose that part of the body that was injected. Use a piece of cardboard to test the hose for leaks. Before attempting any service on hydraulic systems, shut off the engine, which powers the hydraulic pump. Lower the implement to the ground and relieve the pressure. Follow the instructions in your operator's manual, because the specific procedures for servicing the systems are very important to your safety. 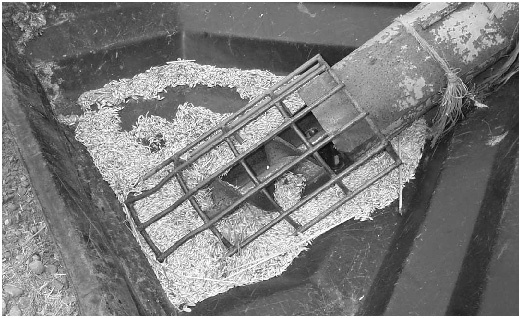 Pull-in points usually occur when someone tries to remove plant material or other obstacles that have become stuck in feed rolls or other machinery parts. Always shut off the power before attempting to clear plugged equipment.